It's A Hard Life / Happy Birthday To Freddie!! This concert is a must for every Queen fan. Not only because it is very hard to find as complete but also because it was held at Sept. 5th 1984, which was Freddie's 38th birthday. Between the songs you can actually hear how the audience sings "Happy Birthday" to him several times. Funny incidents during Love Of My Life. Freddie is probably absent from the stage during the first verse as Brian says "Freddie went home for his birthday.." and starts to play it with only audience singing. After the first verse Freddie comes back on stage and the crowd gets wild. Then Freddie gets a birthday card from the audience and says "I can't read this!!". Freddie continues to sing and when comes the part "When I grow older, I will be there.." he sings "When I grow older.. thirty eight!! !.., I will be there..". That brings smile to my face every time I listen this show ;) . Great show overall, in few songs it sounds as those were recorded too loud but most of the show is very enjoyable and clear. As said before, this is the complete concert (even Saturday Night's Allright For Fighting included!). 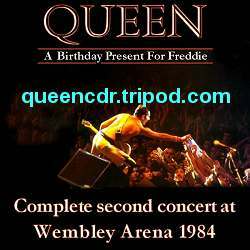 Most of the bootlegs from the second night at Wembley Arena miss Liar, Vocal Improvisation and It's A Hard Life.